Called to action on 2 April 1982, the men of 45 Commando Royal Marines assembled from around the world to sail 8,000 miles to recover the Falkland Islands from Argentine invasion. Lacking helicopters and short of food, they ‘yomped' in appalling weather carrying overloaded rucksacks, across the roughest terrain. Yet for a month in mid-winter, they remained a cohesive fighting-fit body of men. They then fought and won the highly successful and fierce night battle for Two Sisters, a 1,000 foot high mountain which was the key to the defensive positions around Stanley. This is a first hand story of that epic feat, but it is much more than that. 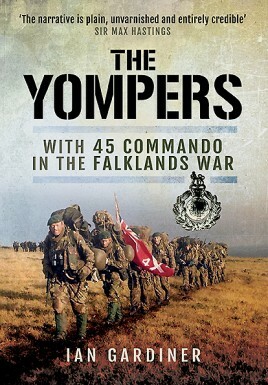 The first to be written by a company commander in the Falklands War, the book gives a compelling, vivid description of the ‘yomp' and infantry fighting, and it also offers penetrating insights into the realities of war at higher levels. It is a unique combination of descriptive writing about frontline fighting and wider reflections on the Falklands War, and conflict in general. Gritty and moving; sophisticated, reflective and funny, this book offers an abundance of timeless truths about war. Postscript: ‘Yomping' was the word used by the Commandos for carrying heavy loads on long marches. It caught the public's imagination during this short but bitter campaign and epitomized the grim determination and professionalism of our troops.